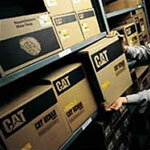 Cat parts, Caterpillar parts – Kelly Tractor Co.
Kelly Tractor Co. is committed to providing you with the right genuine Caterpillar parts when you need them to keep your equipment running. Our parts sales people are trained with the parts expertise necessary to provide responsive service to minimize your downtime. Kelly Tractor Co. has over 30,000 line items to help serve your needs. Including parts for Link-Belt, IMT, Wacker, Eagle Picher, Massey Fergusson, and much more. We also have full access to the Caterpillar parts distribution system and manufacturing plants, including a local regional distribution center. We are pleased to offer our customers an additional option for ordering parts. PartStore users can check a real-time look up of parts availability, examine remanufactured options, and review pricing, all before placing their orders on-line. Caterpillar's on-line parts books, Service Information System (SIS), are also included, to help ensure that the correct parts are chosen. Enter the New Parts CAT Store.